Governor Charlie Baker’s budget plan is set to include changes to the education funding formula. Governor Charlie Baker wants a tax increase to generate hundreds of millions of dollars for battling climate change. He’s pitching an expansion to a Medicare program and, unlike last year, has prepared legislation diving into the complex debate over education funding. And that’s only what Baker has revealed so far. Weeks removed from the pomp of inauguration, he is slated Wednesday to unveil his budget plan for fiscal year 2020 and his much-anticipated take on overhauling the state’s 26-year-old school funding formula — a dual roll-out that could set the tone for the start of his second, four-year term. The public details, so far, make up just a few gears in the complex machinery that is a state spending proposal. But budget watchers and advocates alike say they’re looking for signs of how aggressively Baker could pursue new fronts after years of careful budget maneuvering, and to his critics, overly cautious governing. 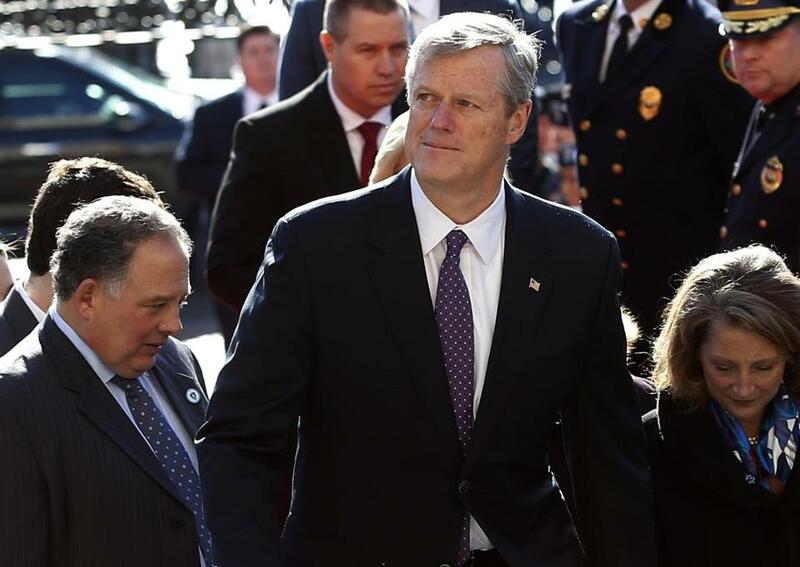 Unlike in prior budget cycles, the state is emerging from a stretch devoid of budget deficits or runaway health care spending, developments Baker aides attribute to his efforts to rein in costs, including in the state Medicaid program known as MassHealth. They also noted his willingness to pour new funds into priorities, from fighting the opioid crisis to supporting the Department of Children and Families. The full scope of his budget proposal won’t be made public until Wednesday. But amid a steady drip of otherlegislativeannouncements, his administration has released some details of his plans, which would need approval in the Legislature before becoming law. The House and Senate must pass their budget proposals in the spring and reconcile the differences before sending a final spending plan to Baker’s desk for the fiscal year that starts July 1. Baker said Friday that he intends to pursue a 50 percent hike to the state tax levied on real estate transfers, which he said could generate up to $150 million annually — and more than $1 billion over the next decade — toward a fund cities and towns could tap for climate change resiliency projects. For home sellers in most parts of the state, the increase means they would pay $6.84 in transfer taxes per $1,000 of a purchase price. The proposal’s effects would be more dramatic on Cape Cod, where the state tax would jump 67 percent. On top of an additional county tax, that means sellers there would be paying $8.76 per $1,000 of a purchase price. The proposal speaks to the importance and the urgency around climate change mitigation, said Eileen McAnneny, president of the Massachusetts Taxpayers Foundation. But that its champion is Baker, a Republican who has signed but generally not proposed tax hikes in the past, signals an approach to starting conversations about revenue “that we didn’t see in the first term, for sure,” she said. Marie-Frances Rivera, interim president of the left-leaning Massachusetts Budget and Policy Center, said she is watching closely to see whether policy makers pursue “new, progressive sources of revenue” to meet the state’s needs and fill expected revenue gaps. That Baker is embracing a tax hike is promising, she said. “I think we’re hopeful. I think it’s a great suggestion that he is more open than he has been in the past,” Rivera said. Baker said he’ll also propose expanding eligibility through a Medicare Savings program to 25,000 additional low-income seniors. The move, according to Baker, could potentially save seniors thousands of dollars in out-of-pocket costs, and would require the state to spend $7 million annually. By doing so, the state could leverage an additional $100 million in federal funding. The administration will likely propose other changes to the state’s Medicaid program as part of Baker’s budget. But after years of plans focused on curbing health care costs or generating new fees, the Medicare expansion is made possible, in part, because the growth in health care spending in the state has dropped to its lowest levels in years, according to the administration. The education funding debate in itself is something of uncharted territory for the Republican. The Baker administration has pumped $500 million in new funding into K-12 education since taking office, including $80 million that directly went toward fulfilling some of the recommendations made by the 2015 Foundation Budget Review Commission, particularly more money for health benefits. But Baker hasn’t before jumped into the messy, complicated policy discussion that surrounds overhauling the existing education funding formula, established in a 1993 law. In his inaugural speech, Baker indicated he’ll be looking to attach some requirements to new funding, which promises to be a major fault line in the policy debate ahead. He said then that “progress isn’t just about money” and his proposal would seek to direct at least some additional funding to specific programs or practices such as acceleration academies, which have seen success in Lawrence, and after-school programs. Baker’s stance that additional state funding for education should come attached with new policy strings puts him at odds with a large coalition, including teachers’ unions and their political allies. They argue that schools don’t need any more onerous “accountability” metrics or bureaucratic tape, they just need lawmakers to make good on the funding promises contained in the 1993 law. But Baker’s support likely gives heft to other education advocates who want to see more than just an influx of cash. Among them are the Massachusetts Business Alliance for Education, which believes new school funding needs to be targeted to initiatives and tracked so policy makers can “better understand what’s working” to close the achievement gap between disadvantaged students and their richer peers, said Tricia Lederer, a spokesperson for the Alliance.